With the growing number of applications on Appexchange, Salesforce users have a choice to get more and more out of their Orgs. It becomes complicated when we really want to install a new app in the Org, and are not so sure about it, as it may damage the data. Also, understanding the application completely and analyzing if it suits our business needs before installing it in our Org is equally required. Well, Salesforce has the perfect solutions for you. A sandbox of your Salesforce Org. And this is what I’ll be talking about, how to create a sandbox of Salesforce Org. Let’s talk a little bit about sandbox before diving into creating one. A sandbox is like a mirror of your org at the point in time you created it. It has all the data of your org and features, and optionally records. 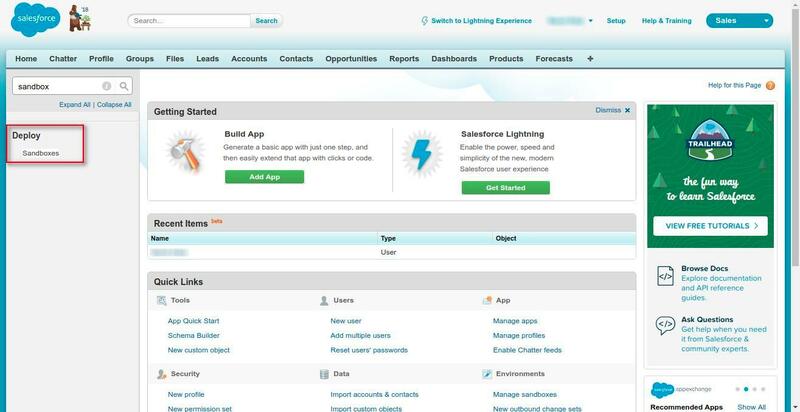 To login into a sandbox, you need to go to the URL test.salesforce.com. Only Professional, Enterprise, Performance, Unlimited, and Database.com Editions support a sandbox. There are four types of sandbox, i.e. Developer, Developer pro, Partial Copy Sandbox, and Full Sandbox. A sandbox can also be used for Development purpose as a production org does not support creating or editing APEX code, so sandbox is used to write, test and then deploy the code in production org. Now that we know what a sandbox is, let us talk about the steps of creating a sandbox. First, go to setup and in the quick access field type sandbox. Now click on New Sandbox button and choose whichever edition of sandbox you want to create. (For Partial Sandbox you might need a sandbox template first). 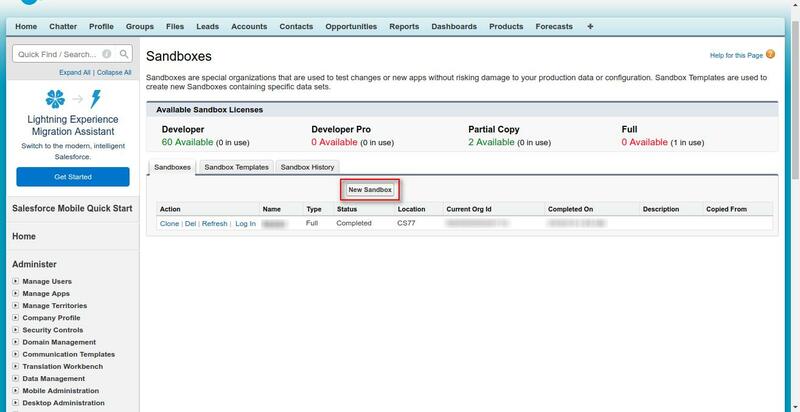 Create a new by clicking on the Sandbox template tab. Select the sandbox type that you want and click on next. Optionally if asked for selecting a template do that and then click on create. Now sit back and relax you’ll be notified once the sandbox creation is complete.